Hello you may have hopped over to me from Susan and seen the lovely project she has done or you have just joined the Blog Hop with me. 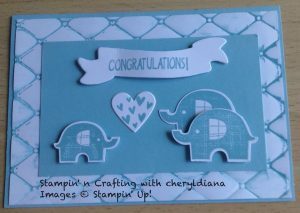 I fell in love with the Elephant bundle and could not wait to make a baby card with it. As the theme this month is Masculine I decided to first make a male baby card. For this card I started off by inking up the Tufted embossing folder with Balmy Blue ink. A piece of Whisper White card stock was then laid onto the ink and embossed. A piece of Balmy Blue card stack was stuck on to make a back ground for the elephants and sentiments. I then stamped the elephants in Balmy Blue ink and punched them out. 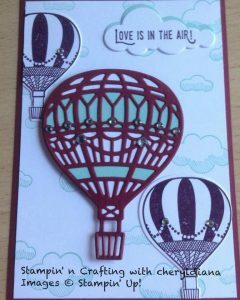 To finish off the card I stamped the hearts and die cut using the heart die from Up & Away Thinlits and stamped the sentiment onto a piece of Whisper White banner from the Bunch of Banners Framelits. For these cards I decided to use set colours which were Merry Merlot, Blackberry Bliss and Pool Party. 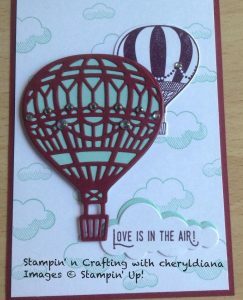 I wanted to use the Lift Me Up stamp set and matching dies as I had not used these in a while. If you have visited me before you will know that I love making my own back ground paper so stamped the clouds in Pool Party all over a piece of Whisper White card stock and cut to size. I stamped some medium sized balloons and die cut them out. These were then glued onto the card base. I then die cut the large balloon and matching back ground dies in Pool Party and Whisper White card stock. These were then glued to the back of the die cut balloon. I wanted them to be slightly raised so Stampin Dimensionals were used. The sentiment was stamped onto a Whisper White cloud in Blackberry Bliss and backed to a Pool Party cloud. To finish off the cards I used the Clear Rhinestones. I hope you have enjoyed looking at the cards I made for this blog hop. Please do leave comments as you hop around this blog hop. Please click on the next button to see what Vicky has used for her blog. 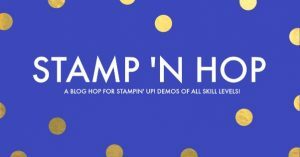 Posted in Cards, Stampin' Up!, Uncategorized. Love the little elephants – so cute! Girl, you went over and above and did it well.